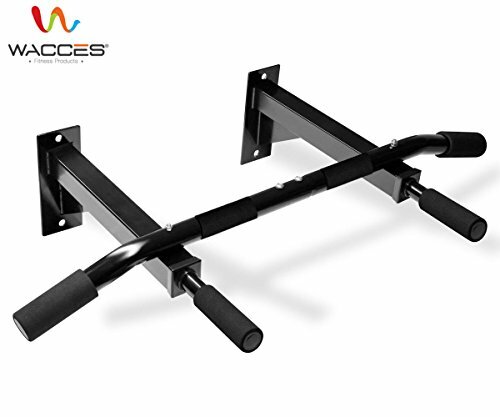 Wacces Wall Mount Chin-up bar is the ultimate pull-up/chin-up bar designed and manufactured to the highest quality standards. If you are unable to use the doorway chin-up bars or simply prefer the wall mounted equipment, Wacces Wall Mount Chin-Up Bar is the best choice since it is constructed of heavy gauge steel and hand welded to perfection. Wacces is the choice of many home gyms, schools, garages, commercial gyms and fitness studios. The wall mount chin-up bar enables you to do various pull-up grip positions (wide grip, reverse grip, close grip, and hammer grip) that work on your compound muscles for rapid and ultimate results! Develop your back, chest, shoulders, lats, biceps, triceps, and forearms using your own body weight resistance. Achieve those six-pack abs by doing a variety of hanging crunches using ab straps that effectively target different areas of your abdomen, including your lower core! Keep in mind there are different accessories you could attach to your chin-up bar including ab straps and dip belts to fully benefit from your equipment. Fits door frames 24" to 32"